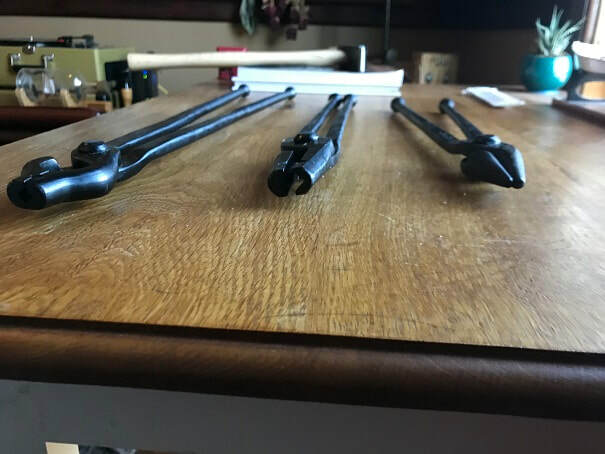 These are the hand tools and anvil tools I selected to get started in blacksmithing with. I also include below, tools that I made myself. 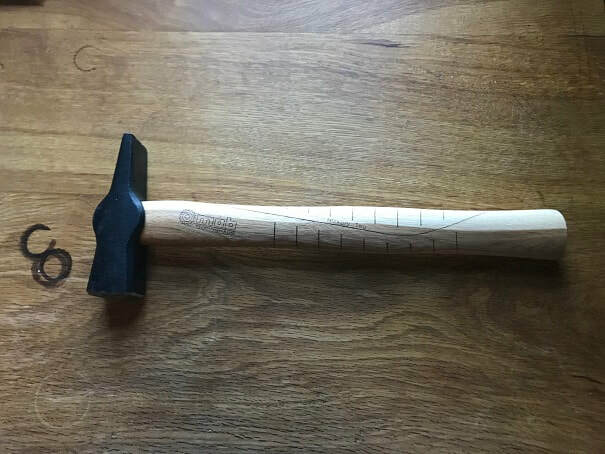 Based on what I learned in various books, including Lorelei Sims "The Backyard Blacksmith", and along with advice from the friendly folks at Centaur Forge, this is my initial set of hand tools. I am hoping to make most tools that I need beyond these. These are real beauties. 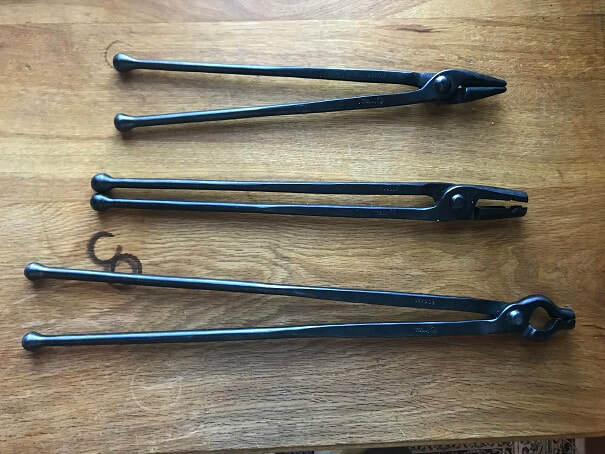 From top to bottom: Scrolling Tongs with 13.5" reins, 5/8" Straight V-bit tongs with 13.5" reins, 1/4" V-bit tongs with 18" reins. End view of the tongs above. Hardie Tools. 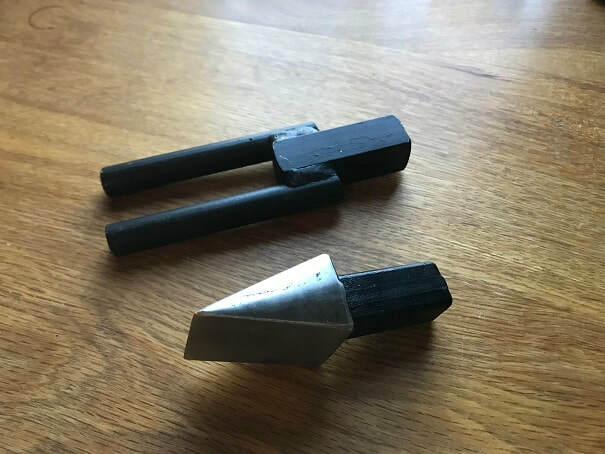 The square stock of these fit into the hardie hole in my anvil. I selected a hot cut chisel, and a bending fork. 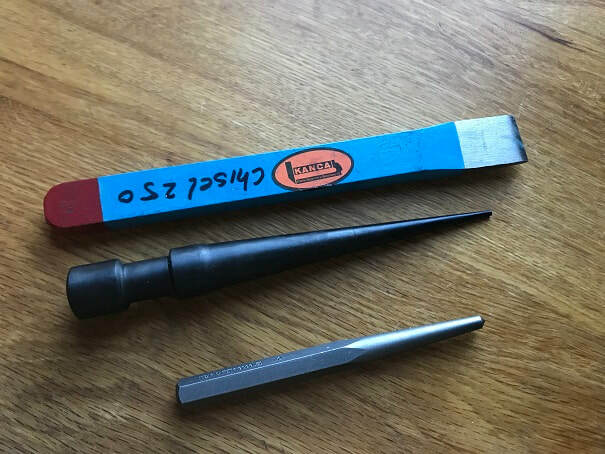 Hand chisel, Round Punch for making holes, Center punch for marking. I intend to make my square punch. Wire brush for brushing scale off of heated metal prior to hammering on it. Soapstone pencil for marking. 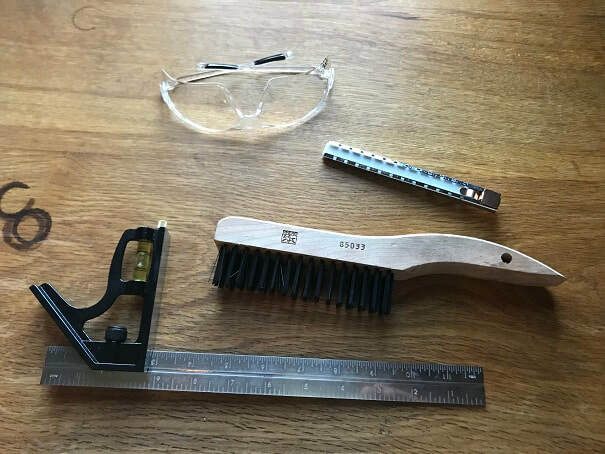 Safety glasses. Steel square. 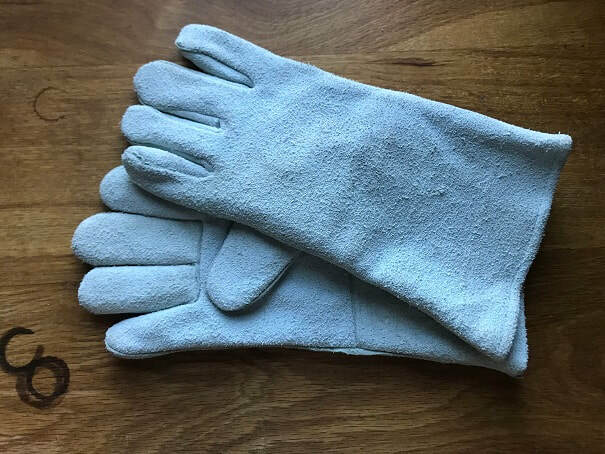 Thick leather gloves for use if and when needed. I haven't found myself using them yet but I want them if needed. I hold hot material with tongs, and it is not recommended to hold your hammer in a gloved hand. I made the pritchel plate below from a 1/2" x 3.5" x 10" piece of mild steel. The pritchel plate I made has 1/4", 5/16", 3/8", 7/16", and 1/2" holes. Layout of pritchel plate marked out using soapstone. Handle cut to shape using a cutoff wheel in a hand grinder. A torch or plasma cutter would be quicker, but I don't have those tools. I saved the drops for future projects. Ground and filed all the edges and corners smooth. Drilled the holes and marked the hole sizes with punches. 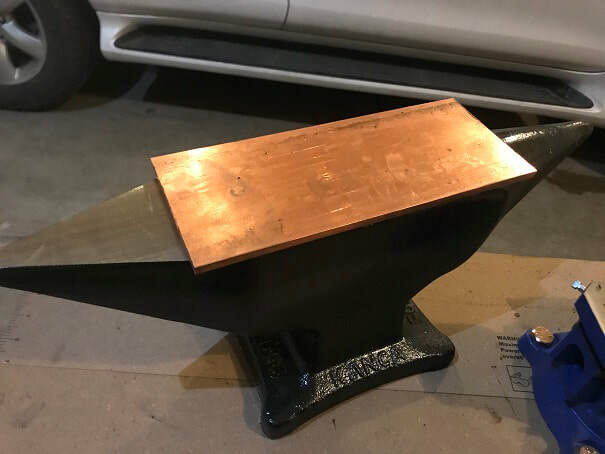 1/4" thick copper plate , the width of my anvil. 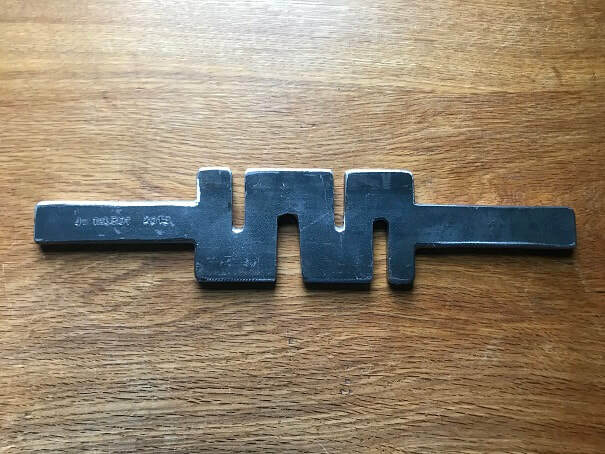 I will place this on the anvil when using a hot chisel to cut through metal, to protect the surface of the anvil, and to provide a soft base material for my chisel to come into contact with. 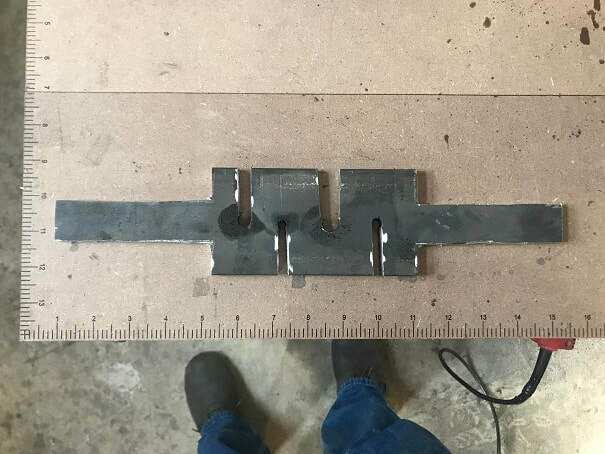 3/8" x 3" x 14" mild steel plate. 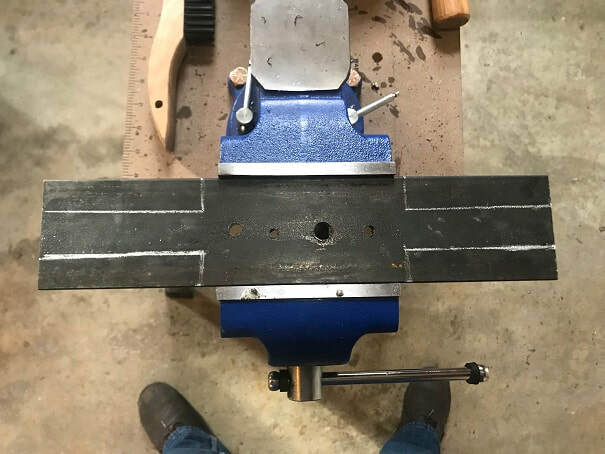 I have marked out the handles and have drilled a 1/4" hole, 5/16" hole, 3/8" hole, and 1/2" hole which will be the ends of the slots in the bar twister. Twisting bar, rough cut out with a hand grinder with an abrasive cutting wheel in it. It would be easier and quicker to cut such a thing out using a plasma cutter or torch, but I do not have those tools. End result is just what I wanted. 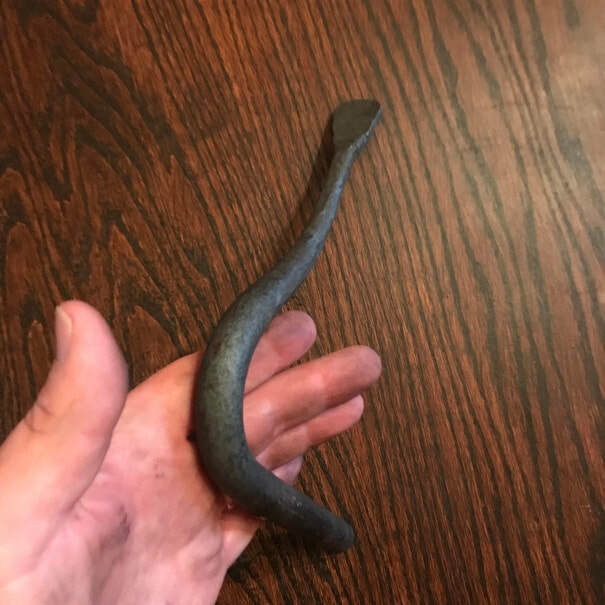 Finished Bar Twister for use in blacksmithing. All the edges are rounded off and the slots are dressed and ground. 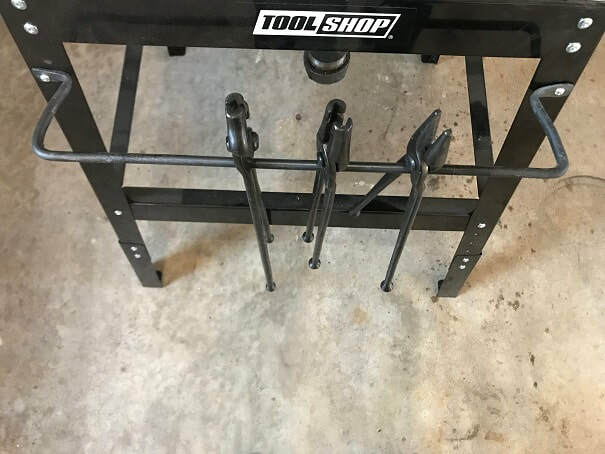 The slots, from left to right, are 5/16", 1/2", 1/4", 3/8"
This simple rack was one of the very first things I made using the forge that I built. 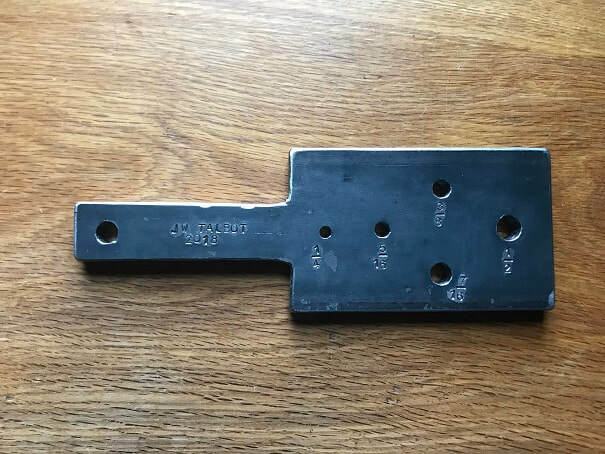 It is made from 3/8" round stock. 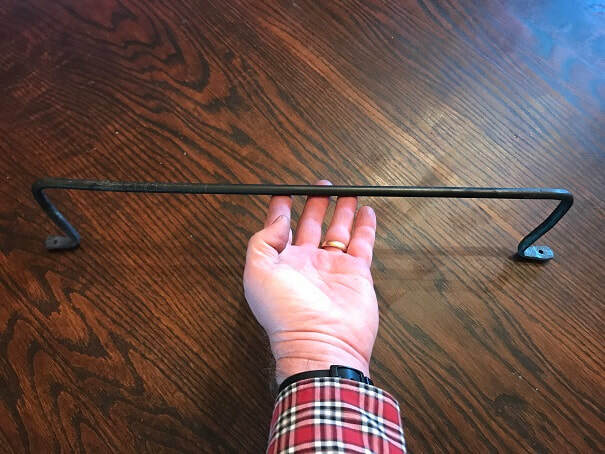 I made this hold-fast from 5/8" round bar.